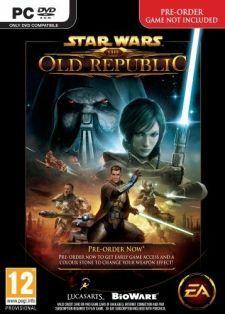 A Polish website listed -then pulled- some information and box art about The Old Republic that it probably shouldn't have. Fans of Star Wars: The Old Republic are chomping at the bit, as there's going to be some new announcements about the game this week at Comic-Con in San Diego. However, it looks like a European retailer has accidentally let at least one cat out of the bag by listing (and the quickly yanking) box art and pre-order information for the game. Poland-based Empik.com released the info on its site earlier today, including a comment about how pre-ordering the game would give players extra content including a "colour stone to change your weapon effect." Unsurprisingly, the page has been taken down since it was first posted, but enough people managed to snag screenshots that it's now a matter of public record. It'll be interesting to see whether or not this information is confirmed later this week at Comic-Con. That said, the box art certainly looks legitimate, doesn't it?